Filmmaker R. Harvey Bravman has assembled 80 hours of interviews from Brookline residents who survived the Holocaust. These interviews have been turned into a documentary film, "Soul Witness, The Brookline Holocaust Witness Project." Their stories capture the stark terror of the times: Donia Mir eluded Nazi troops by living in a forest for 19 months, much of it spent in a hole in the ground. Esther Gens cowered with her mother in a haystack as German soldiers, searching for Jews, thrust their bayonets into the straw. The tellers, many now deceased, shared their experiences as part of an interview project with the town of Brookline in the early 1990s. Meant to become a “living memorial,” it included interviews with nearly 40 local residents who’d witnessed the Holocaust. But town budget priorities shifted, momentum flagged, and the memorial never came to pass. 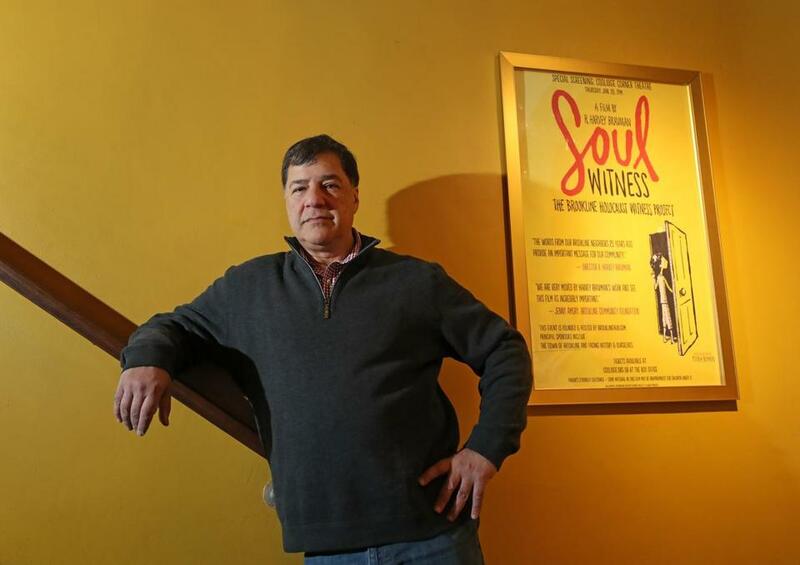 Now the survivors’ testimonies are being shared thanks to filmmaker R. Harvey Bravman, whose documentary “Soul Witness, The Brookline Holocaust Witness Project,” condenses more than 80 hours of interviews into a one-hour film. Bravman said the documentary would never have happened if a Brookline official in 2014 had not contacted him about the recordings, which had languished in storage for the past quarter-century. Portions of the interviews have been shown occasionally on public access television. For Bravman, his enthusiasm for the project grew as he watched and rewatched the footage. The original project was spearheaded by local residents Regina Barshak, a Holocaust survivor, and Leon Satenstein, a US serviceman who witnessed the liberation of the Dachau concentration camp. Though neither is still living — Barshak died just last year — Satenstein left the town of Brookline roughly $10,000 to help complete the project when he died in 2012. Satenstein and Barshak had found an ally in Stephen Bressler, who at the time was a town employee and helped facilitate the project, even conducting some of the interviews. But the main interviewer was Holocaust scholar and professor of English emeritus at Simmons College Lawrence L. Langer. “I have heard stories [from the survivors] that stand my hair on end,” said Langer. For survivors such as Aron Greenfield, who lost both parents and seven siblings during World War II, the original project was an opportunity to share stories he’d struggled for years to tell. Cheryl Lefman, whose late father, Henry, is featured in the film, said that participating in the project enabled him to fulfill an important promise to his own father, who died after he was beaten by camp guards. Lefman added that her father rarely spoke about his experiences — partially to shield his family but also because it was too painful for him to revisit. In the film, however, Henry Lefman recalls wanting to avenge Nazi crimes as he walked to freedom. Mir, who hid in a forest for a year-and-a-half, says in the film that she remained haunted by the experience. “At night I see myself every time in a different place — forests and that grave — running around to look for something to eat,” she says. “That’s my life.” Mir died in 2002. Bravman said that because most of the film’s interviewees are no longer living, deciding what to keep and what to exclude from the film was particularly wrenching. Bravman said he has raised about $24,000 in donations to help pay for the film, which he said has cost roughly $40,000 to make. He hopes eventually to expand the film, adding more voices, including, perhaps, those of some of the descendants. Similarly, Lloyd Gellineau, Brookline’s director of diversity, inclusion, and community relations, who first told Bravman about the tapes, said the town hopes to eventually make them available to the public. Many of the tapes are also housed at Yale University. “The original intent was to have them accessible to the public in an appropriate way,” said Gellineau. In the meantime, “Soul Witness, The Brookline Holocaust Witness Project” will have its first screening Thursday at Coolidge Corner. The event,which is sold out, will be followed with an open-talk session with Bravman, Bressler, and Langer.